Lens Description: The 85mm f/1.4 Aspherical Lens from Rokinon gives you a medium telephoto field of view that\'s ideal for portraits. It includes a special chip that allows the lens to work with the camera's focus confirm, auto exposure, auto metering and auto white balance functions. With hybrid aspherical lenses and multi-layer coating, you will produce sharply defined images with a minimum of flare and ghosting. 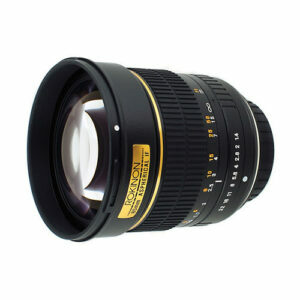 The 85mm lens focuses as close as 3.3' (1.0 m) from the lens, and includes a lens hood. This lens is designed for use with full-frame film and digital cameras, and may also be used with cameras with APS-C sized sensors. A truly beautiful lens..Swapped for Sigma 85mm 1.4 only for AF. I had a version with AF confirmation chip but i have found my self most often relying on my eyes during focusing. Keeper rate is no very high especially if you shoot bellow f2.For someone who is in no hurry in taking pictures Rokinon is a great choice. Slightly sharper than Sigma according to my tests although the margin is very narrow. Build quality is great and the smoothness of focusing ring is excellent, Exactly as manual focus lens should be.This is a must lens for those r video DSLR lovers. To summ things up there is not a single bad thing that i can say about this lens.